The FDA is in the process of implementing the Unique Device Identification (UDI) System in a series of phases. Currently, all Class III and implantable, life-supporting and life-sustaining medical devices require UDIs. The next phase of the system will be implemented by September the 24th, 2016. After this date, all Class II medical devices will legally require UDI labels before product distribution. Additionally, Class III devices and PHS-licensed devices intended for certain uses will require direct marking. 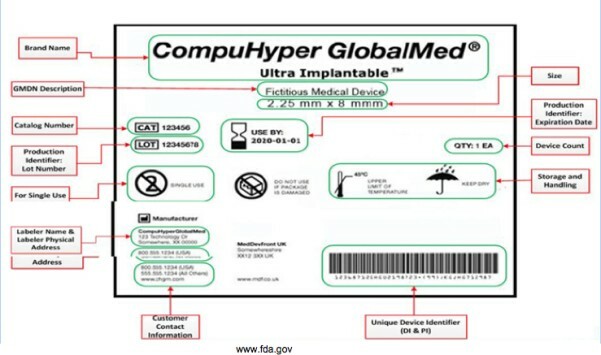 The UDI System provides a unique code for the medical device. The FDA hopes this will lead to more efficient and accurate identifying of devices in the case of adverse event reporting, post-market analysis, managing device recalls and inventory documentation. A medical device is considered Class II by the FDA if the device is of moderate risk. That is, existing methods and controls cannot assure the effectiveness and safety of the product. Condoms, infusion pumps, and powered wheelchairs are examples of Class II devices. To see if your product may classify as a Class II device, visit the FDA device classification guidance site. The UDI is a numeric or alphanumeric code unique to the medical device that should be placed at the bottom right of the device label. It may consist of plain text (human readable) and AIDC (machine readable). Two parts form the UDI: the mandatory device identifier (DI) and the conditional production identifier (PI). The Global Unique Device Identification Database (GUDID) will store only the DI, and not the PI. However, PI flags may indicate the conditional PI features shown on the device label. With less than 4 months for the implementation of the FDA’s third phase of the UDI system, companies of Class II devices need to ensure steps are taken to establish UDI for their products. Firstly, an accredited Issuing Agency must be hired. The Issuing Agency develops the unique labeler code for use in UDIs. The UDI must then be placed on the label and package. For reusable devices and those reprocessed between patient use, direct marking may be necessary. (This is clarified under the FDA’s 21 CFR 801.45). Lastly, the data must be entered into GUDID and maintained should any changes occur. Exceptions to the UDI rule include devices found in convenience kits. That is, the devices found within the immediate packaging of a convenient kit do not require UDI labels, so long that the convenient kit itself is labeled. A first aid kit is an example of a convenient kit; reusable medical devices packaged together are not. Similarly, individual single-use devices that are distributed together in a single package until use are exempt from the UDI label requirements. This exception does not apply implantable devices. (Further exceptions can be found under the FDA’s 21 CFR 801.30.) For more information on the UDI system in general, visit the FDA site. The UDI system will change and benefit all parties involved with the production and use of medical devices. Given the diversity and scope of the medical device industry, the change can be challenging to implement. While the regulations must be detailed to encompass this diversity, it may be difficult for companies to understand the rules that may or may not apply to their specific product. RegDesk can help clients understand the relevant policies in order to develop and implement product strategies successfully. With access to leading experts, RegDesk can provide the appropriate guidance to a client’s individual products.